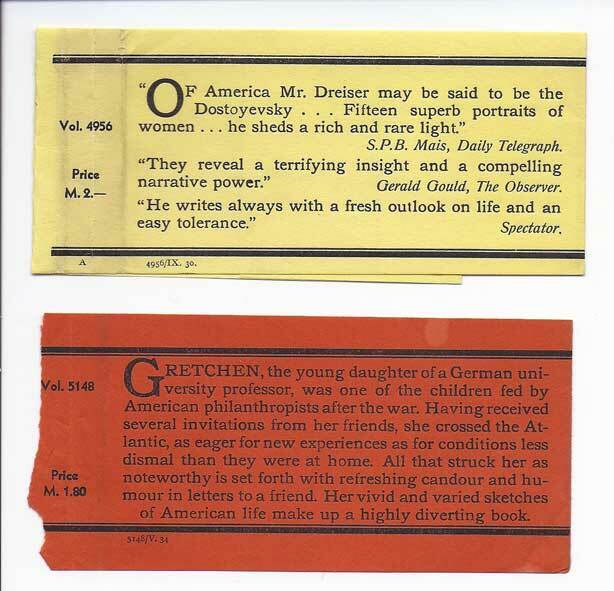 This is the third in a series of blog posts on Tauchnitz advertising materials, and I admitted in the first one to a long interest in this kind of ephemera. There are times though when I feel that it's a bit absurd to be collecting odd bits of paper from 100 years or more ago that were designed to be disposable. It's the same absurdity that comes when the value of a book with its dustjacket is more than twice the value without dustjacket, so that the value of the dustjacket is apparently more than the value of the book. That's not too much of a problem with Tauchnitz Editions, relatively few of which had dustjackets anyway. But I feel much the same way about wrap-around bands, the small strips of paper that were wrapped around books to help them catch the eye of bookbuyers. The Todd & Bowden bibliography records 60 of the coloured bands, used from February 1930 through to April 1935, when the introduction of colour-coded wrappers made them unnecessary, and speculates that there may have been many more than this, covering more or less all books issued in this period. It also notes a single copy of an uncoloured band from December 1929, shortly before the introduction of colour-coding. 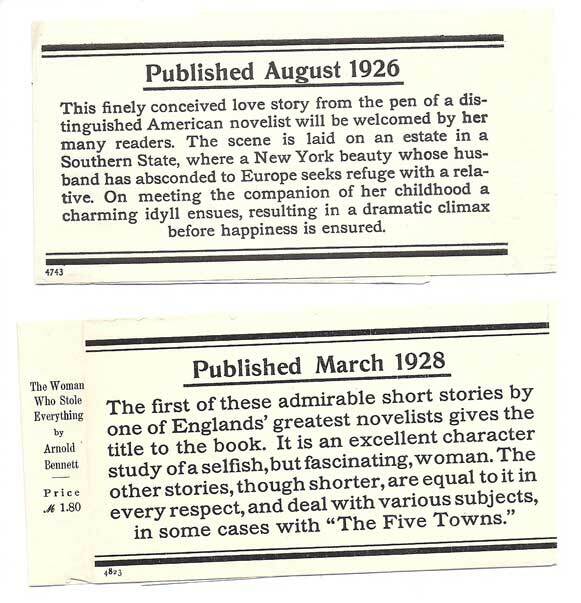 I now though have copies of several more uncoloured bands, going back as far as August 1926. Far from being a brief prelude to the coloured bands, it seems that uncoloured bands may have been used for almost as long as the coloured ones. This also means that the bands themselves were not introduced during Max Wegner's period as General Manager, but date back to the period of Curt Otto. Wegner of course can still claim credit for the introduction of colour-coding to Tauchnitz, which he went on to develop further at Albatross. Uncoloured bands from volume 4743 'The secret that was kept' and from volume 4823 'The woman who stole everything'. There is one key aspect of the uncoloured bands, whch has probably contributed to their rarity. Whereas the later bands folded into the wrapper with flaps at front and back, in the same way as a dustwrapper, the earlier ones wrapped tightly around the entire book. As soon as anybody wanted to open the book, the band would have to be removed and would usually be torn and discarded. Preserving the band would have needed to be a very deliberate act. In comparison the later bands at least alowed the books to be opened without removing or destroying them, so the chances of survival were greater.